Home Automation System installations are continuing to increase year after year. This indicates an heightened interest in Home Automation – as led by the higher end homes – which these systems support. However, Home Automation does not have to require complicated, control-everything systems with costly 3rd party installers, or complicated set-ups. e5 Global Innovations will provide simple, elegant, low-cost devices for the home to automate simple tasks. That’s it. Just connect and enhance your home environment. Everyday Living Made Easy. Although this article was released in November, 2012, it illustrates the rapid rate of increasing home automation system installations. 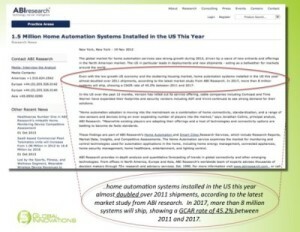 Highlighted text:…home automation systems installed in the US this year almost doubledover 2011 shipments, according to the latest market study from ABI research. In 2017, more than 8 million systems will ship, showing a GCAR rate of 45.2% between 2011 and 2017.